Influenster sent me this razor for free, but all opinions are my own. Here's the deal. I've always been a cheap razor user. Sure, I've dabbled in the art of luxury razors but when it comes time to buy cartridges I always chicken out and go back to the basics. About a year ago I fell in love with the affordable and amazing Dorco razors. They fit the bill-luxurious, cheap, and effective. I didn't feel too bad using cartridges and my body got shaved. Hooray. Now I took this little guy into the shower, lathered up with some Fun by Lush, shaved my legs-and my legs have never been so smooth. I'm literally feeling my silky smooth legs as you read this. Now I can't speak to the longevity of the razor just yet. But upon first use, this is by far the best shaving tool I've used. The results are immediate and pass up the dorco in terms of effectiveness. This is me trying to rotate the ball. It was easy to use, and the results speak for themselves. I'm not sure if the little metal ball is really the reason why this one is so good-maybe it is. But I highly suggest you pick one up just for this first-time, silky smooth experience. It looks like you can buy it at Walmart for about $6.95, each cartridge after that is about $4.50. If you can afford this luxury in your life-I highly recommend you add it to your monthly budget and daily regimen. So soft. So smooth. Probably magic. This is how flexible this razor is. As you can see, it can either glide at 30 degrees or 90. P.S. 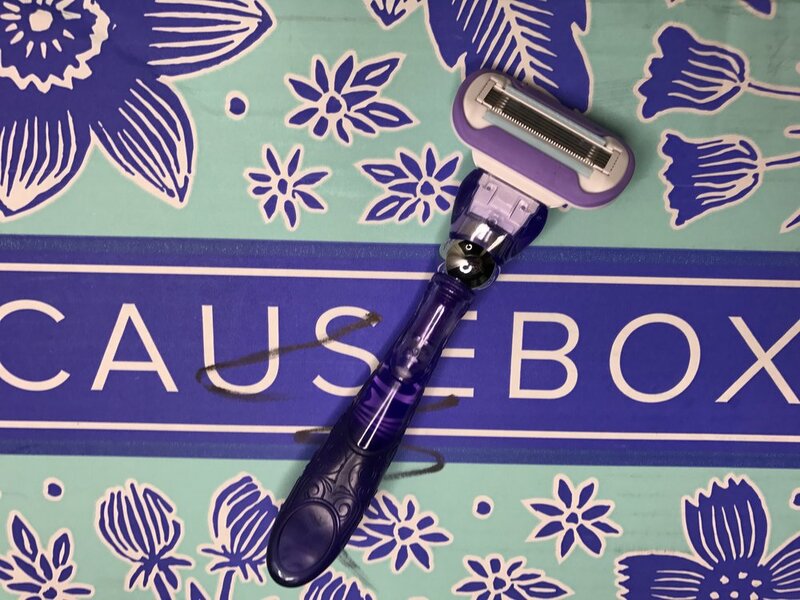 this month's causebox went perfectly with our razor!